Well, that hiatus was a bit longer than I intended it to be! Back in the fall I was realizing how behind I was in posting and decided to take some time off of the bloggin' to focus on some other areas of life - of course, in the meantime I've completed many a project just perfect for sharing that I'll need to catch you up on. The main reason for both the blog absence and the extra projects? Baby Girl Kamicar is soon to be making an appearance in our household! That has meant mucho organization, nursery decor creation, purging to create more storage areas and - of course - a finally finished bathroom remodel! We are super excited for the new addition to the family and all focus has been on getting ready for baby. Until I get my thoughts together on some of the bigger initiatives like a coat closet rehaul, a 50 step organization list and more purchased furniture than our credit card would like to admit, let's start with something small: FOOD! Part of preparing for baby has meant stocking the freezer and figuring out the best ways to plan out healthy, filling and easy to put together meals when cooking in the kitchen will be the last thing I want to do. We've taken advantage of Dream Dinners, made an extra batch of Breakfast Burritos, found 2 for 1 meat sales at the store and froze a couple additional pasta meals. But in the meantime, we wanted to also focus on fresh ingredients that would help us plan out meal options. We tried out Blue Apron for a few weeks and loved it - great tasting meals that never took more than 30 minutes to put together, made with ingredients we probably would never pick up on our own. We'll probably pick this back up in the fall/winter timeframe, but we saw some overlap with another plan we had just committed ourselves to for the summer: farm fresh veggies ready for pick up! 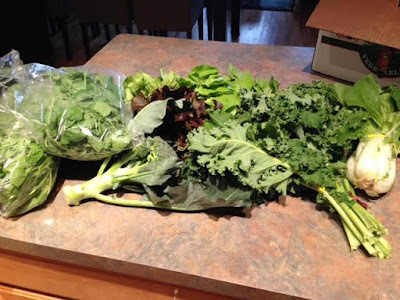 We had been talking about joining a CSA for awhile now, so when a recommendation and discount code popped up on my Facebook feed from a friend we decided to pull the trigger. We signed up for Angelic Organics and chose the "every 2 weeks" option based on feedback from someone who said getting a box a week was more than they could realistically get through. We pick up every other Saturday at a location just a few blocks from our house. We are on Box #2, after starting to receive our fresh veggies in early June. And they weren't kidding - the fridge is stocked with lettuce, arugula, dill, pea shoots, beets and more! We are having fun reviewing the list of incoming items and finding recipes to match, and I can honestly say I've eaten more vegetables in the last few weeks than I have in a long time! Box #1 included radishes, but rather than just slice them up for a salad, this vegetarian sandwich was too good looking to pass up. And this is coming from an ardent carnivore who loves her some turkey sandwiches. We skipped the red onion included in the original recipe, and this prego girl missed out on the goat cheese that I mixed right into Bob's avocado spread. However, mashing up avocado to use as a sandwich spread instead of globs of mayo may be the next big thing for us. I ate these three days in a row for work lunches. Box #2 arrived with 3 heads of broccoli, so we got to work finding recipe options. When Bob brought up the idea of making a cream of broccoli soup, a quick Pinterest search gave me exactly what I was looking for before I even knew I wanted it: Copycat Panera Broccoli Cheese Soup. Oh my yum - I love getting that soup at Panera (along with the Bacon Turkey Bravo on an Asiago Bagel) and was looking forward to making our own little bread bowls of goodness. In a dutch oven, saute 1/2 yellow onion in 1 Tbs of butter. Set aside. Wipe out dutch oven and melt 1/4 cup butter, mix with 1/4 cup flour, stirring constantly for a few minutes. Slowly whisk in 2 cups half and half; 2 cups chicken broth. I ended up adding another 1/2 cup or so of broth later to cut the thickness of the soup a bit. Add 1 head diced broccoli, 1 cup of julienned carrots and the onion. Simmer for 25 minutes or until veggies are tender. Add 1/4 tsp nutmeg, salt and pepper to taste and 8 oz shredded cheddar. We used a mixture of cheddar and jarlsburg, when sharp white cheddar wasn't available. Mix in to melt the cheese, then use immersion blender to get rid of some, but not all, chunks. Whole Foods had 2 size options for our bread bowls - ginormous or mini. So we decided to get the mini versions and use regular bowls for the majority of our soup, with the bread added as a special treat. Next up in the CSA adventure: finding recipes for beets! I pinned this beet chip recipe - what do you think?